Stressing over asteroids? It’s out of your control. Rub a kitty head instead. Worry Kitties get lost around RVA in 2013. Namaste, y’all. LostCatsProject is honored to be included in Noah Scalin’s new book, Unstuck: 52 Ways to Get (and Keep) Your Creativity Flowing at Home, at Work & in Your Studio. 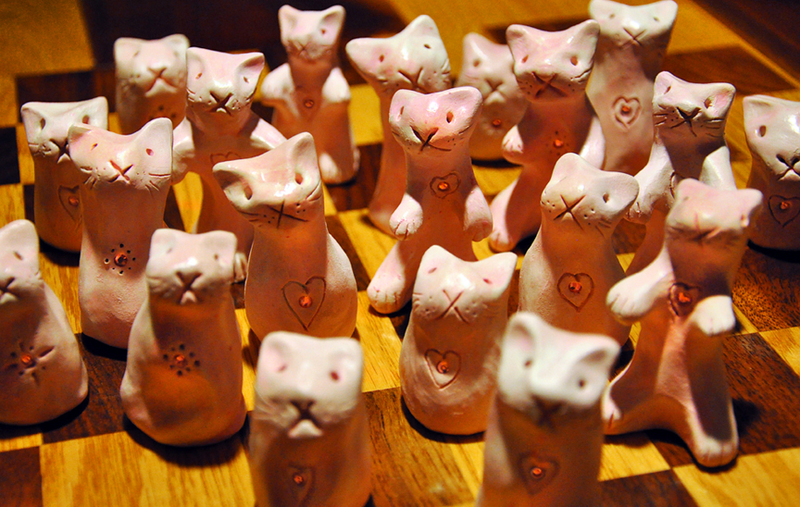 For some “Lost Art” inspiration check out chapter 51 to read about Real Small Art League & LostCatsProject. Thanks to this book, we are unstuck and full of ideas! We look forward to getting creative again real soon. 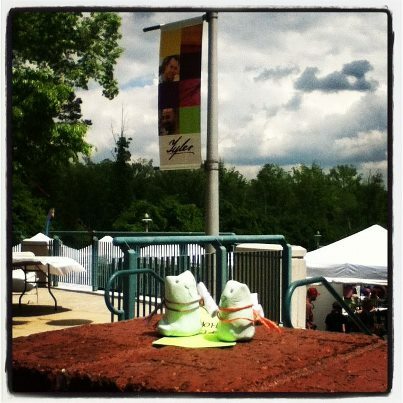 JTCC’s Fool For Art: Fortune Kitties! Come find a fortune kitty! LostCats let loose at John Tyler Community College’s Fool For Art. Excited to check out the cool art vendors and fun activities. Why should the bunny have all the fun? 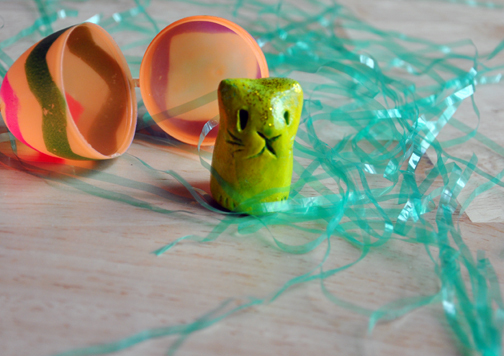 itty-bitty-kitties that have been hidden inside colorful Easter eggs. Happy spring, RVA! On Friday October 22, 2010 Lost Cats Project will hide a special-edition litter of Glow-Kitties in historic Shockoe Slip to help celebrate 1708 Gallery’s 3rd Annual InLight Richmond. Come on out and get your glow on! GayRVA contacted LostCats for a limited-edition creative project. During the month of September 2010, the LostCatsProject and GayRVA will work together in support and celebration of Pride in Virginia. 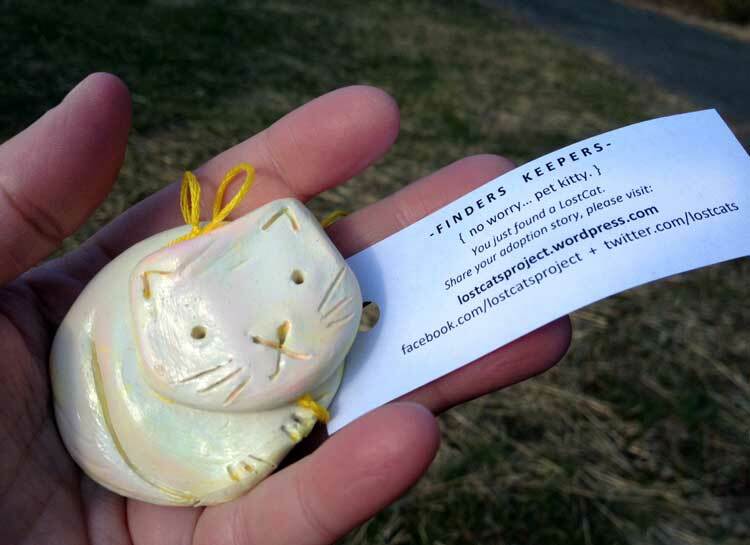 Each week a litter of handmade clay cats will be set free throughout Richmond and surrounding areas. Watch for clues and photos of where you can find a lost cat of your own on GayRVA.com or by following on Twitter or Facebook. About GayRVA: GayRVA is Richmond, Virginia’s go-to source for news, entertainment, and information about the LGBT community. Their mission is to move RVA forward by reflecting diversity, bringing a voice to the table, and opportunities to connect. The Lost Cats Project proudly supports Real Small Art League and their group exhibition Creative Kindness Throwdown at Crossroads Art Center. Dozens of Lost Cats were up for adoption at the opening reception held on July 16, which raised $45 to benefit Richmond’s Art 180. The show runs through September 8th at Crossroads Art Center, in the Trolley Stop Gallery, 2016 Staples Mill Road, Richmond, VA. Participating artists include: Tiffany Glass Ferreira, Alyson Plante, Betsy Sayre and L. Campbell Maxey. About the Real Small Art League: Real Small Art League is an ongoing effort to inspire random acts of artistic kindness and creative awareness around the world. To date, over 600 artists have made, documented and given away tiny works in surprise locations. The ongoing journey and public responses are published via www.realsmallart.com. We truly believe a little work of art can go a long way. About Crossroads Art Center: The Crossroads Art Center has served the Richmond area as a Fine Art and Crafts Gallery for over 8 years. The art center represents over 225 local and regional artists in all types of media. Crossroads is actively involved in the Richmond local artists’ community and thereby an important educational and cultural resource for the community.